In a groundbreaking research which is first of its kind, researchers at the Harvard John A. Paulson School of Engineering and Applied Sciences (SEAS) have developed a first single lens that can focus the entire visible spectrum of light, including white light, in the same spot and in high resolution. Metalenses, which are basically flat lenses, use nanostructures to focus light. These are comparatively nascent in the field of optics but bear many advantages over the traditional lenses (bulky, curved lenses) currently used in many optical devices. They are thin, easy to fabricate and cost effective; thus the recent breakthrough extends these advantages across the whole visible range of light. However, they had been fraught with problems earlier being limited in the spectrum of light they could focus well. Focusing the entire visible spectrum and white light had been a challenge for researchers in the past since each wavelength moves through materials at different speeds. This means that two different wavelengths (for eg.- Red and Blue) moving through a similar medium would reach the same location at different times resulting in different foci. This led to image distortions (chromatic aberrations). 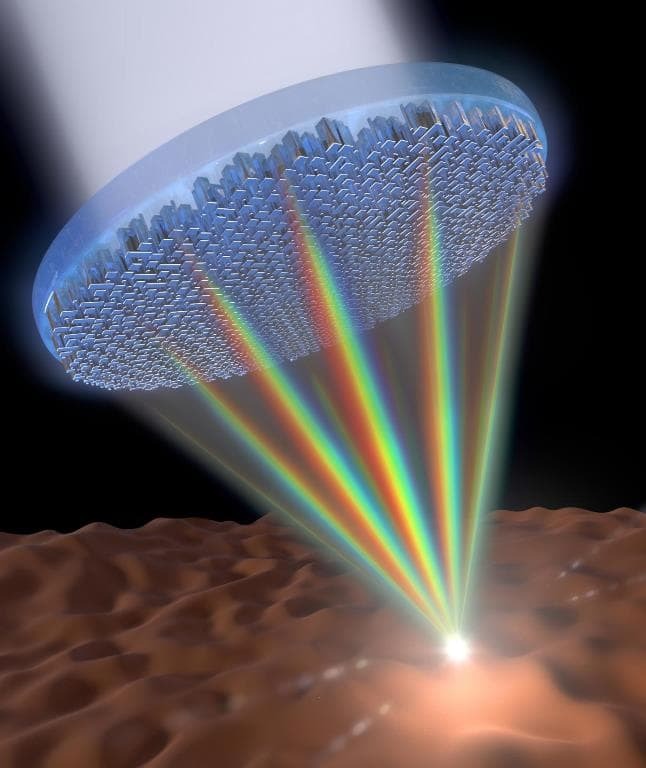 The metalenses developed by Federico Capasso, senior author of the research and the team used arrays of titanium dioxide nanofins to equally focus wavelengths of light and eliminate chromatic aberration. They created units of paired nanofins that control the speed of different wavelengths of light simultaneously. These paired nanofins controlling the refractive index on the metasurface, are effectively tuned, to result in different time delays for the light passing through different fins. Doing so ensures that all wavelengths reach the focal spot at the same time. Combining two nanofins into one element, can tune the speed of light in the nanostructured material, to ensure that all wavelengths in the visible are focused in the same spot, using a single metalens. This also dramatically reduces thickness and design complexity of achromatic broadband lens compared to composite standard achromatic lenses, quoted Alexander Zhu, co-author of the study. Elaborating further on the advantages of the breakthrough, the researchers noted that with the achromatic lens it will be possible to perform high quality, white light imaging. This they hoped would bring them one step closer to the goal of incorporating these into common optical devices such as cameras. The future prospects include- scaling up the lens, to about 1 cm in diameter which could open a whole host of new possibilities, such as applications in virtual and augmented reality. The research is published in the journal Nature Nanotechnology.